Paris’ First Department Store ? – The oldest department store and the only one of the Rive Gauche. – Founded in 1852, by Aristide Boucicaut and his wife Marguerite with a new culture of commerce that included fixed prices, lower margins, home delivery, item exchange, mail order, promotional periods and sales, a commercial model that would soon be copied around the globe. – Now the property of LVMH Luxury Group. 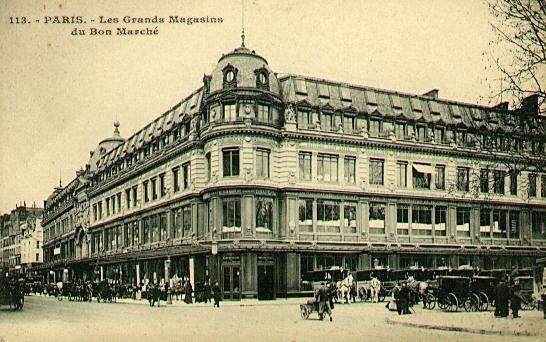 – Since 1988, La Grande Epicerie de Paris, a subsidiary of Le Bon Marché Rive Gauche, has become one of the capital’s leading food stores. A book ? Au Bonheur des Dames, Émile Zola. Where ? 24, rue de Sèvres, Paris 7.